AMA | Art Museum of the Americas of the Organization of American States (OAS) and the Friends of AMA announce Art After Dark 7: Caribbean in Motion. The popular after-hours event brings art and music lovers together for one night to celebrate al fresco in the lush French gardens of the OAS. The main visual backdrop of this year’s event consists of large-scale video art projections on the OAS’s historic building façade, produced by video artists throughout the Caribbean, and selected from a pool of entries by our friends at IDB Creativity. 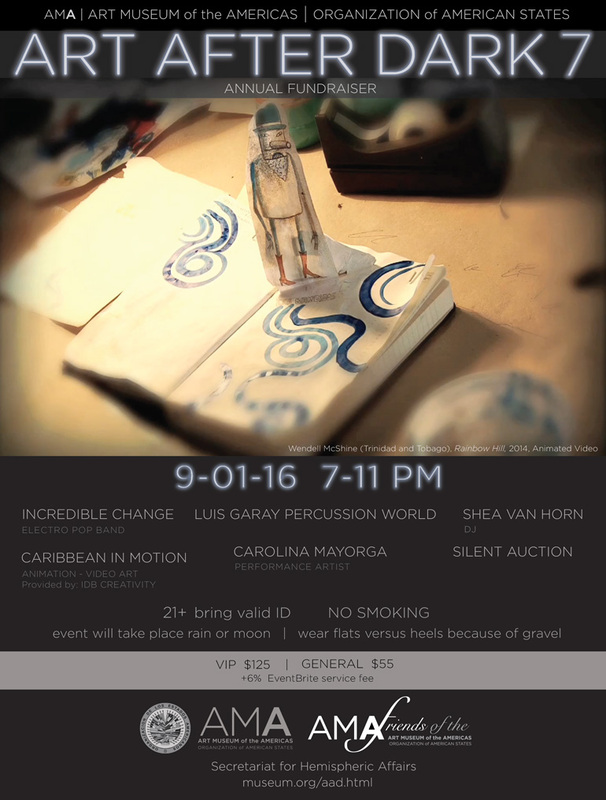 DC’s finest electro-pop band Incredible Change, and Luis Garay Percussion World, will perform live sets. DJ Shea Van Horn will keep the crowd moving throughout the night, and performance artist Carolina Mayorga will present La Vie en Rose-2. Luis Garay . The VIP areas also return with a silent auction. As the OAS’s cultural component, AMA is responsible for publicizing and promoting the mission of the Organization in the Washington, DC area through high profile cultural events like Art After Dark. AAD also is our signature fundraising event that allows the museum to maintain a vigorous schedule of exhibits and programs for our members and museum visitors. We strive to support artistic expressions that advance democratic values, peace, diversity, tolerance, justice and human rights in a way that transcends through craftsmanship, ingenuity and content. OAS Assistant Secretary General Nestor Mendez states that “as a focal point for showcasing the Art of the Americas, the AMA continues to offer refreshing glimpses into the creative genius of the artists of this hemisphere. The theme of this year’s Art After Dark, ‘Caribbean in Motion’, highlights cutting-edge video art of our member states, adds to the experience the spice of live music and performing arts, all set against the backdrop of a fun and celebratory vibe. Art After Dark lends itself to the AMA’s optimizing of its role as the cultural branch of the OAS, and demonstrates how the visual arts may be used to advance and promote its core pillars of Democracy, Development, Human Rights, and Security. I am thrilled to celebrate the artists who will be showcased at this year’s Art After Dark, and as Assistant Secretary General I am proud to support the mission of the AMA as it advocates for creative expression, cultural exchange, and dialogue among member states. Staged in collaboration with the Friends of AMA, Art After Dark allows AMA to bring out some of the most innovative emerging artists of the Americas. Caribbean in Motion is the theme for the video art that will be projected on the façade of the historic OAS building. Selected from a recent exhibition of the same title presented by the Inter-American Development Bank (IDB), in partnership with the Anime Caribe Caribbean Animation Festival, this series seeks to explore the multifaceted social and economic benefits associated with the animation industry. These benefits include economic growth, increased social justice and awareness, as well as a greater capacity for creativity, artistry, and expression. In a world with shrinking material resources and a growing reliance on innovation and technology, the creative industries are becoming an ever more important tool of economic growth. Animation, the art of illustrating video sequences, is one such industry that is experiencing growing potential as both a business and an art form. Caribbean in Motion aims to increase awareness of the importance of supporting a vibrant creative economy. Developing new outlets for creative production may pave the way for a sustainable, 21st Century social and economic development. Carolina Mayorga is a Washington, DC –based artist who has exhibited her work nationally and internationally for the last 20 years. Her work addresses issues of social and political content. These themes often translate into multimedia pieces including video, performance art, photography and drawing. For Art after Dark 2016, the artist will present La Vie en Rose-2, a new performance art piece that comments on beauty and stereotypes. Incredible Change play synth-laden electronic dance music influenced by everything from Italian house to early Factory Records, featuring members of Ra Ra Rasputin and Lode Runner. Brock Boss channels Bauhaus vocals over arpeggiators, syncopated rhythms, chorus-drenched guitar, eliciting kinetic vibrations with a cast of DC musicians, including Rob Hart and Ed Porter. Pulling in classic dance elements and pairing them with dark analog sounds and distinct lyrical presentation, the hope is to connect and provide energy. Luis Garay Percussion World has been prasied by the Washington Post for its "marvelous virtuosity." Garay is a classical, jazz and Afro-Latin multi-percussionist, composer, recording artist, and educator. He has accompanied numerous top artists and has been a performer, instructor, adjudicator, clinician, director, founder, composer, and conductor of timpani and percussion for symphony orchestras, bands, jazz, and percussion ensembles. DJ Shea van Horn, co-founder of Mixtape, spins an eclectic mix of electro, alt-pop, indie rock, house, nu-disco, and anything else he thinks you can dance to. The Mixtape party began in 2008, has been voted "DC's Best Gay Dance Party" by Washingtonian Magazine, "Best Men's Party" by The Washington Blade, and "Best Monthly Party" by Brightest Young Things' BYGays. -exclusive VIP bar area adjacent to the stage and where the performers will be hanging out with you with exclusive bites by La Tasca, wine tasting by La Gran Cata, and exclusive drinks by Remy Martin. Art After Dark, our annual after-hours fundraising event, rings in its 7th year. Details forthcoming. Art After Dark is presented by the Friends of the Art Museum of the Americas, a non-profit 501(c)3, dedicated to funding the programming of AMA. You must be at least 21 years old. The OAS is a smoke free environment and smoking is only allowed in designated smoking areas. We reserve the right to refuse service to anyone who does not comply with OAS regulations or security's instructions.